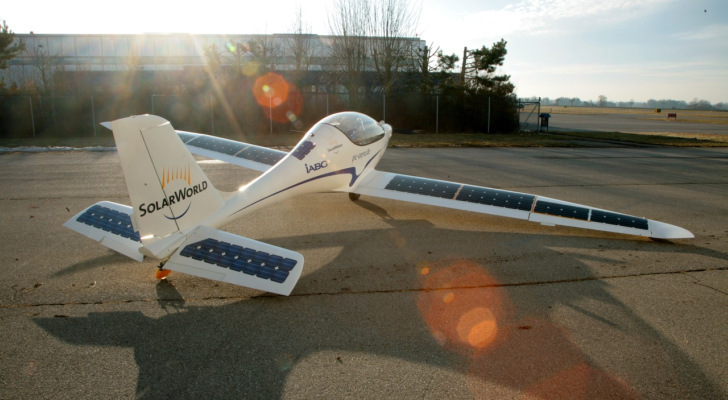 Following the maiden flight of their Elektra One electric plane, SolarWorld and PC-Aero have unveiled a new solar-powered version that gives the small plane twice the range of the electric version. The Elektra One Solar plane features solar cells on the wing surfaces that harness energy from the sun to provide zero-emissions flying with lower operating costs and less noise. The Elektra One Solar is a one-seater plane that is built of carbon composite materials and has a longer wing span than the initial Elektra One electric plane that gives it a better glide ratio. In addition to being able to travel just over 600 miles, the solar plane can fly for more than eight hours, weighs only 400 pounds and can carry a payload of 220 pounds, including the pilot.